Whether you are looking to take up fishing as a hobby or are looking for a new or replacement item you will find a wide range of equipment to suit the local waters in and around Warwickshire. Our tackle caters for coarse, match and game anglers. If you are in need of friendly helpful advice look no further. Poles From £5 to £2,000. For poles to 16 metre poles look no further - for a full range. A FREE elastication service is offered on new poles bought from us. Please call in to discuss your needs. 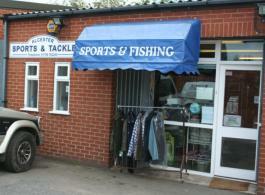 Rods A large selection of fishing rods suitable for lakes, rivers and canals, and all types of fishing. In addition to the stock we carry you can also order from our catalogues. Please call in to discuss your needs. Reels - choose from a wide selection ranging from a first reel to the most advanced available. If you are looking for an item not listed please telephone to discuss your needs or call in.